Hello sailor! Look ship shape and get the boys wolf-whistling you in this smart and sophisticated Ladies' Navy Officer Fancy Dress Costume. The officer outfit includes everything you need to look the party and comprises of a black jacket with double breasted gold button front, officer's colours printed on the chest and gold trim around the sleeves, an attached mock shirt front with tie and a knee length straight black skirt. 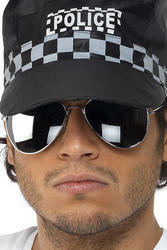 Completing the look is a black officer's hat with gold detailing and peak. Ideal costume idea for a uniform or movie themed fancy dress party.